Lil Wayne loves pouring champagne on his Samsung Galaxy S7. We learned that from the first commercial for the phone that starred the rapper. Surely you remember him pouring bubbly on his handset, and then warning his friend who thought it was ok to soak his iPhone with champagne. No problem, Lil Wayne just handed his pal a spare Galaxy S7 that he happened to have. 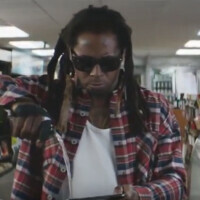 In a new ad released by Samsung today, we see Lil Wayne walking back and forth in a convenience store, pouring champagne on his Galaxy S7 as is his wont. He asks the guy behind the desk where the champagne is. It seems that he is about to run out of the stuff, and needs more to drench his phone with. So what does Lil Wayne use to pay for his new bottle of champagne? Well, Samsung Pay of course. Thanks to Magnetic Secure Transmission, the mobile payment service can be used at any store that allows customers to swipe a credit card. And because the Samsung Galaxy S7 sports an IP68 certification rating, the handset and Samsung Pay work like a charm even with the phone smelling like a New Year's Eve party. Let's hope for Lil Wayne's sake that he doesn't get pulled over on the way home. We'd imagine that it might be hard to convince a cop that it was his phone that was drinking. This guy's time has been long over like 5 years ago. Celebrities will always be a celebrities regardless of when the last time they were on the spotlight and depending how much they have achieved. And because he achieved big during 'his time', his relevancy will long live. I don't get it. They have what, 3-4 ads where its just Lil Wayne pouring champagne on the S7. What's the point of having 3 different ads telling me the same thing? How in what world do you not get? To convey a message about the S7's water resistance? Actually this is also a promo of Samsung Pay not just the water resistant features of the phones. This is *hit.Negative full add.As an advertisement manager I can tell that the person who made this and also stamped on it should be fired. Are these guys coco?Save the environment,yeah right! Very sure you don't call the shots even if you really are the Ad manager. Fingerprint authentication will fail (wet), but pre-entered PIN will work (not sure if timeout will be enough for his first bottle). The new commercial caused articles to be made about it and got us talking about it, so the commercial succeeded, presuming the goal was to raise awareness about the product. This ad might be new to you, but I've been seeing it for 2 or 3 weeks on tv.